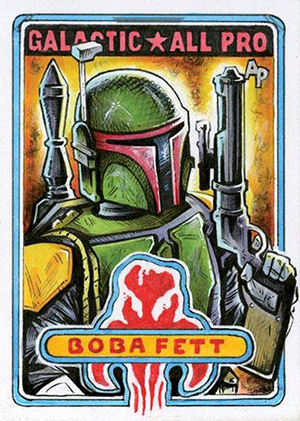 2015 Topps Star Wars Masterwork has a lot of quality sketch cards. And like any release should, there's plenty of variety when it comes to styles. One artist that really stands out in the release, especially for long-time sports card collectors, is Jason Crosby who used old Topps designs as inspiration for his cards. 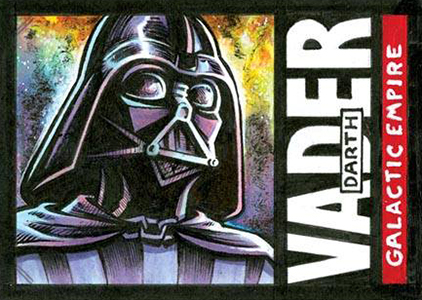 Crosby did nearly 100 Star Wars Masterwork Sketch Cards. You can currently see a lot of them on his Facebook page. Crosby's style ventures more on the the comic and caricature side that photo-realism. Combine that with the familiar layouts from more than 50 years worth of Topps baseball and football designs and you've got a series that bridges two collecting worlds. We wanted to know a little more about Crosby's work on the set and his inspiration. Here's what he shared. 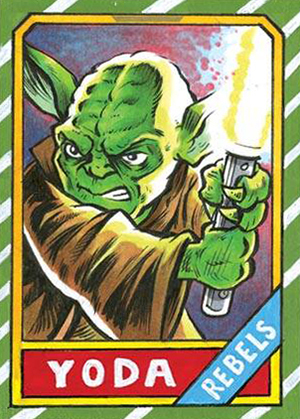 Cardboard Connection: What was your inspiration for basing your Star Wars Masterwork sketch cards on old Topps designs? 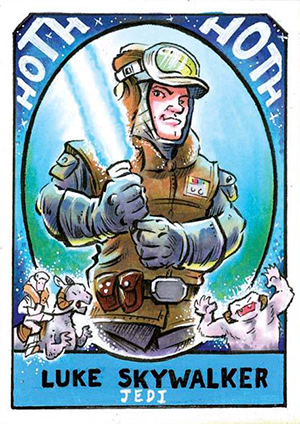 Jason Crosby: Topps has so many iconic sports card designs that I thought it would be fun incorporating them into the Star Wars universe. I tried to select designs I thought would best match the characters, their logos and their ships or weapons. CC: Out of the ones that you did for the set, do you have a particular favorite? Why? JC: My favorite Topps design will always be the 1985 Topps Football. It's simple and bold but allows the art to stand out. I did 18 sketch cards using this template, which I hope collectors like. I also like the 1972 Topps Baseball design (used for a Luke Skywalker single and a Darth Vader four-card puzzle), 1986 Topps Football (Yoda single) and the 1972 Topps Football All Pro design (used for a Han Solo single). 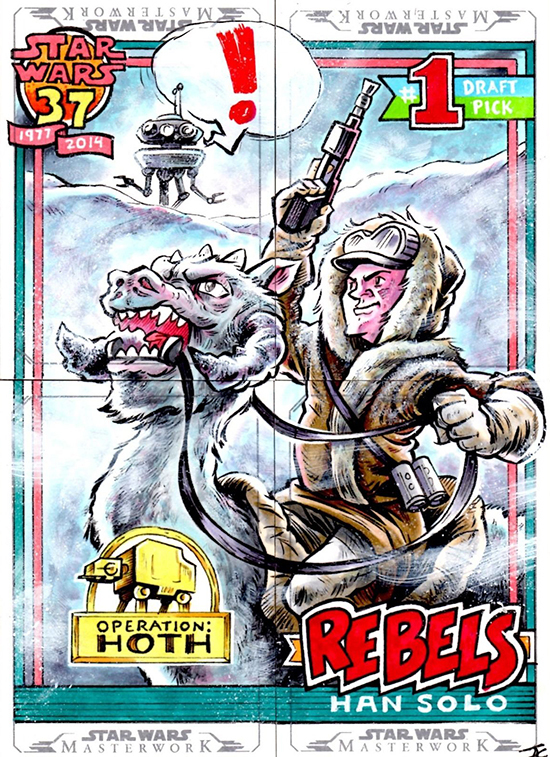 Maybe my favorite piece of art for the series was the four-card Han Solo, 1991 Topps "Operation: HOTH" puzzle (designed after the Desert Shield cards). By the way, I'm still looking for a high quality Chipper Jones from that set! CC: Are you a card collector yourself? If so, what do you collect? JC: I've been a long-time card collector and grew up collecting all the major sports cards starting in the mid '80s. It was a hobby that my Dad and I shared together. We traveled many weekends to the local card shop, shows and even to several National conventions. As an adult, I've been able to go back and piece together most of the major rookie cardss from the late '70s to mid '90s in a high grade. CC: How did you get started in sketch cards? 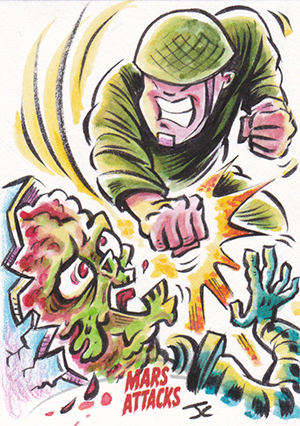 JC: I fell into the sketch card world after Topps saw a piece of my fan art featuring a giant-brained martian from the Mars Attacks franchise. They asked if I'd like to participate in their Mars Attacks: Invasion set and the rest is history. Over the last year and a half, I've been lucky enough to work with most of the major card companies. CC: Is there any advice you'd give to anyone wanting to break into the industry (sketch cards)? JC: I'd say it's like any other passion -- you have to work at it. Practice until you have a small number of solid cards then email them to the art directors. CC: As an artist, who are some of your inspirations? JC: No one's work has influenced me more than the great Jack Davis. I've had the chance to meet him on multiple occasions and he is as nice of a man as his art is iconic. Crosby continues to keep a busy schedule. 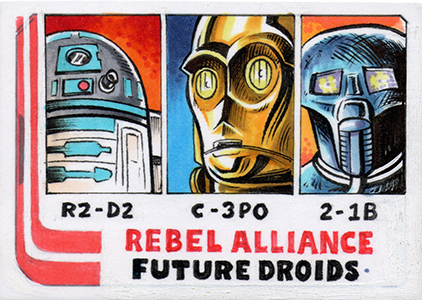 Besides his editorial illustrations, he's got sketch cards in several products coming down the pipeline. He's also been having fun with a fan art project called JEEPERS!, which features mock trading cards of Scooby-Doo villains. He started it as a personal project several years ago but it has since transformed into a full-fledged group project that has art from several artists. Collectors can also commission Crosby to do sketch cards as well as Artist's Proofs from projects he's worked on. For details, check out his Facebook page or send him an email. MARS ATTACKS OCCUPATION 11 Creator Autograph Card Pack w Jason Crosby Exclusive!